Kz's school gave us back these books. These was first term's books. Second term will start in June. So the other day, I was going through these books, I thought I could learn a little Mandarin as well, so I picked book #1 (there were 5 books, can you see?). I was expecting simple Mandarin First Words kinda thing like "wo" (me), "ni" (you), "jia" (house). But I was wrong, these Mandarin books straightaway started with sentences! I wonder how 3 year-old kids memorize the characters. Anyway, I prepared these for the teachers. 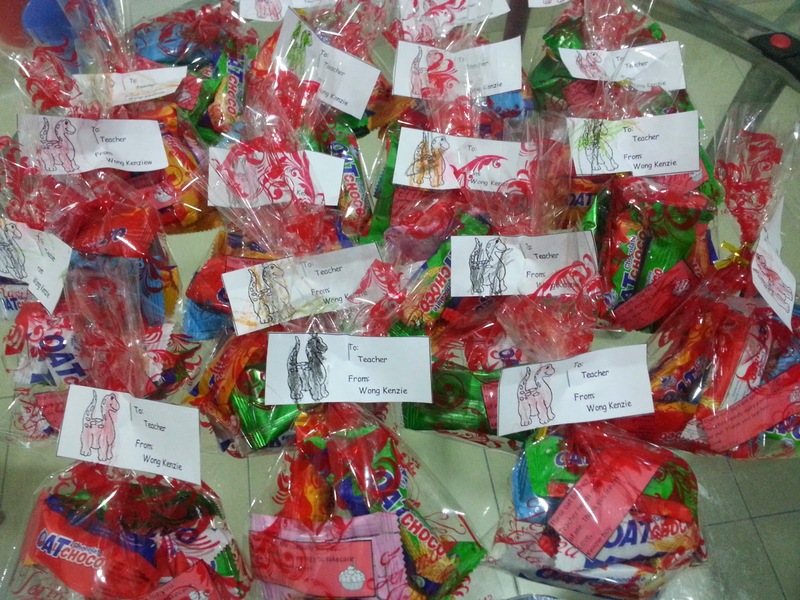 The kindy will be celebrating Children's Day together with Teacher's Day. These are just packs of oat bars wrapped with a note inside and a self-coloured tag from Kz. Hope the teachers like it. Here is the happy boy that morning. When he sees the cupcakes, he says he wants to go to school, haha. So you can learn with your kids lo? Terbalik I ask Kz to teach me back, hehe.. I dunno leh, banana, hehe.. I tried to learn Mandarin a few years back. I cannot remember the characters and give up liao hah..hah...The gift packs for the teachers are nice. I am sure they will be happy coz, don't we all love gifts even if they are oat bars? Hubby who knows Mandarin also says it's hard, coz you gotta memorize the characters.. Wah, I'm wondering how on earth a 3yo can do the same.. So nice of you to prepare something for the teachers. Oat bars for the teachers are a good idea. Very healthy snacks. The little note says: These oat bars are specially for you. Teacher needs more energy to takecare of me, thank you.. Haha..
What a cute message. The mummy is so cleber wor! Monday again and so, no holidays for today!! i think many of us were super excited watching the Thomas Cup 2014 Finals last night huh?? it was so "gan cheong" lor.. In the opening round earlier, World No 1 shuttler Lee Chong Wei beat Kenichi Tago in a 21-12, 21-16 straight set to score the first point for Malaysia.. However, Tan Boon Heong and Hoon Thien How lost to Kenichi Hayakama-Hiroyuki Endo in the first doubles following a close rubber 21-12, 17-21, 19-21.. Second doubles team Goh V Shem-Tan Wee Kiong defeated Japanese team Keigo Sonoda-Takeshi Kamura in a 19-21,21-17, 21-12 rubber game.. Chong Wei Feng had lost to Kento Momota in the second singles 15-21, 17-21.. wow, that gives a nail biting 2-2 in the overall result.. and the pressure is all placed onto the third singles Daren Liew, all hope was placed on him.. Daren then lost the first set 12-21 but took the second 21-18 for a rubber game.. wah, more and more "gan cheong", the last set for the last game leh!! and then the last set, one point one point like that they race to reach the match point.. but haiz, Following a close point-for-point last set, Liew failed to overtake his Japanese opponent and finally lost 17-21.. i guess while many of us were hoping for the victory after a 22-year "drought", it's a national pride lah (and of course with that the by-product would be a national holiday today, hahaha).. anyway, i think the Malaysian team did their best to go so far, but Japan did even better to beat China and then make their historic first win of the Thomas Cup.. kudos and bravo to both teams!! Don't curse me, I zzz at 9pm jor, kinda expected the results.. Okok, don't kill me..
yalor, everyone also thought this year was the best chance to win because we are against Japan (and not China or Indon), but then still cannot bring back the Thomas Cup after 22 years.. It's ok if out of topic, my blog doesn't have that canggih system scoring thingy la, keke..
How come the school didn't provide "Mandarin First Words"? Then I can learn also ma.. I can take the knowledge, and teach G also..
Haha, am laughing.. Yes, good idea, I never thought about it leh.. If sekali ahh, then no need celebrate so many times.. Real Teacher's Day was 16th May.. But they dragged until tomorrow 27th to celebrate together with Children's Day.. More fun kua, with party food and all..
Wah, Meow, you busy lor.. Teacher's Day, Sport's Day and Report Card Day.. Tomorrow Children's Day too.. Class party never ask for food contribution meh? Please blog about it.. Eh, I remember your tong sui thingy.. Was is for Teacher's Day party? Children's Day pulak Meow cook what to bring to school? Wow! Great effort there about the gifts. So sweet. I'm sure you, my dear, made everyone's day and your boy must be the popular boy in class. Hehe, not very popular la, but maybe after today, he will be *ahem* more popular, kakakaka..
Coz Teacher's Day + Children's Day is supposed to be tomorrow, but I pandai-pandai send the goody gifts over to the teachers today, kakakaka..
You seriously can allow your gal come to KL. Got so many vacancies here!! If got vacancies in this kindy I also want.. Near to my kid and I don't have to worry about transport issues anymore.. hehe..
wow, so nice of you to prepare those gifts! Just for fun, plus, I have extra of everything in the house - the oats, wrappers.. And the tag (and notes) were printed using office facilities, keke.. Happy school holiday to your boy! Nice gifts. You are so hardworking and thoughtful to prepare them. 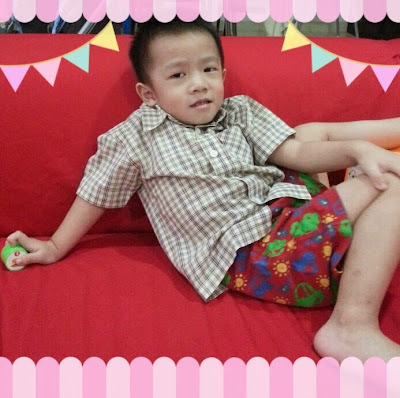 He still attends daycare even tho' there are no school.. No lessons only, but daycare still on as usual.. I'm not hardworking la, I just like all things cute and nice, hehe.. I never understood how the teachers would feel on seeing the gifts made by the students & parents until my wife became a teacher at private school. She was very happy indeed over the kind thoughts and messages more than the food or gifts. Last time she received too many cakes until we had to share with our condo guards. Ooops! Now she is a lecturer at a private university and the students & parents would still make a big card from whole class plus assorted gifts. The gifts were so expensive sometimes. Anyway it's the tought that really counts and anyone would be happy too. I hope the the teachers will be happy.. It's not much.. Just oat bars.. And a note..
Hah, really ahh? I myself dunno Mandarin, I wonder how am I gonna teach Kz.. Yep, they terus started in sentences.. Wah, susah oohhh..
Whoa........ Whisky sample in a bottle, canggih oohh you !! Eh, during my time, when I was in primary (and secondary) school, we didn't prepare goody bags also.. We collected money, and went out together with teacher to a restaurant nearby to have western food..
Now only started to "heng" goody bags I think..
School holiday coming, what are your plans for the kids? 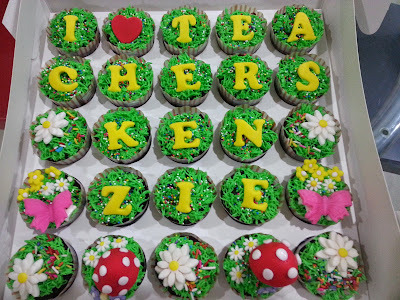 No plans wor.. Kz still goes to daycare everyday as usual, just no classes..
how lovely ((: i do miss celebrating teacher's day. I love party food, hehe.. Bihun, curry chicken, sausages, egg sandwiches, jelly..
Yep, ordered from the homebaker who lives same block at my condo..
Wah, you "gor jiong" lor, I can't make so pretty cupcakes leh.. Can learn tho', but gonna take a long time.. teehee..
Nope, dunno Mandarin leh.. Only know Cantonese, English & Malay, keke..
Sure wallop lor.. Budak, kan.. But I see the cream & icing, quite jelak, kaka.. Ya la, dunno Mandarin, hoping Kz can teach me now.. So difficult the Mandarin books? How the children learn like this? 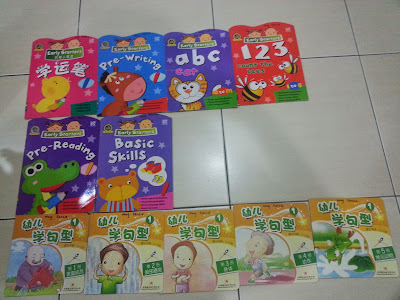 Ya wor, I looked at the books again lastnite.. No first words leh.. Straight started with sentences..
Yep, they had food & fun & party whole day yesterday.. Came home with a lot of (junk) food & snacks in his bag, which, of coz I didn't give it to him..
Those oat bars! Are they Oat Choco? Where do you buy them? Yep, correct.. I got it from my colleague who gets from her friend who is selling it.. She said it's very hard to get, no stock, coz everyone is buying it now.. Hmmm, new trend? Is like that one. no more one or two words for Chinese...I'm banana too but I have some basic so my son and me are like learning from each other... do revision together. He learnt and I learnt too. I like how you wrapped everything and added a special note! I'm sure the teachers loved it! The teachers must be super duper happy on that day.... Kenzie looks kind of cool here too!